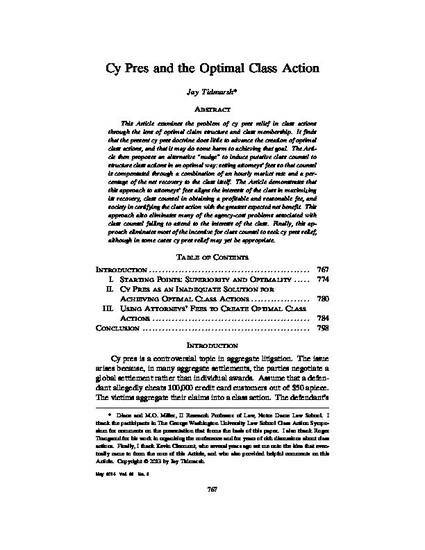 This Article, prepared for a symposium on class actions, examines the problem of cy pres relief through the lens of ensuring that class actions have an optimal claim structure and class membership. It finds that the present cy pres doctrine does little to advance the creation of optimal class actions, and may do some harm to achieving that goal. The Article then proposes an alternative “nudge” to induce putative class counsel to structure class actions in an optimal way: set attorneys’ fees so that counsel is compensated through a combination of an hourly market rate and a percentage of the net recovery to the class itself. The Article demonstrates that this approach to attorneys’ fees aligns the interests of the class in maximizing its recovery, class counsel in obtaining the most profitable (but reasonable) fee, and society in certifying the class action with the greatest expected net benefit. This approach also eliminates many of the agency-cost problems associated with class counsel failing to attend to the interests of the class. Finally, this approach eliminates most of the incentive for class counsel to seek cy pres relief, although in some cases cy pres relief may still be appropriate.